Winter can be a grueling time for people. It's cold, it can be hard to get around, and slipping and falling risks are increased. It's easy to think that cats are impervious to the detrimental effects of cold weather because most of them have fur. The truth is that our feline friends can suffer from some of the same uncomfortable or dangerous cold weather conditions that we can. Here are some cold weather consequences for cats and the associated tips to keep them safer and more comfortable. There are many food and non-food substances that can be toxic when eaten by cats. It's important to be diligent all year about what your cat has access to that might harm him if he eats it. In the winter-time, there are a few extra substances around to be aware of. Rock Salt: Salt is commonly used as a de-icer on roads and sidewalks in cold climates. Some cats are drawn to licking it up. Cats also ingest salt when they walk through it, then lick their feet, bellies, and legs to clean it off. Eating small amounts of de-icing products can cause vomiting and diarrhea. Eating larger amounts can cause your cat to develop an electrolyte imbalance and this can lead to increased thirst, kidney damage, seizures and death. Salt products are also very irritating to cats' paw pads and skin. 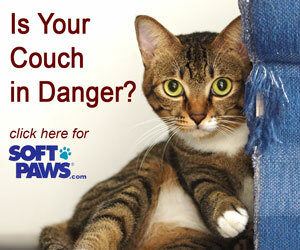 Your cat's feet and pads can become cracked, bleed, and even get infected if they walk on too much salt. Try to keep your cat inside during the winter to minimize his potential exposure to rock salt and other substances. If he does go outside during the winter, make a habit of wiping down your cat's belly, feet, and legs when he comes inside. Doing this will remove the de-icer before it can irritate the skin or be ingested by your pet. Antifreeze: There is more antifreeze around during the winter and it is extremely hazardous to cats. One teaspoon can kill a cat. Unfortunately, cats can actually be drawn to licking up spilled antifreeze; the sweet taste attracts them. Clean up any antifreeze spills immediately and well (Clean up as much as you can, soak the rest up with kitty litter, and use large amounts of water to rinse the area). Store unused antifreeze where it can't be knocked over and licked by your cat. Don't allow your cat to roam the neighborhood by himself. There are antifreeze products that are labelled as "pet friendly" or "safer for pets." These products contain an additive that causes the antifreeze to taste bitter rather than sweet. It is important to understand that these products are still not safe for pets to ingest. The hope is that animals will be more unlikely to be drawn to the more bitter taste but you should still be diligent about cleaning any spills. Cats with arthritis can experience more pain associated with their joints when the weather is cold. Here are some tips on how to keep your arthritic cat more comfortable during the winter. Keep your cat moving: It's easy to be more sedentary in the winter months but that can be detrimental to sore joints. Continue to play with your arthritic cat daily to keep the joints from becoming stiff and more painful. Watch your cat's weight: If your cat is moving less during the winter, it may be necessary to decrease his calories a bit. Becoming overweight puts extra strain on already-sore joints and this aggravates arthritis. Consider medications or supplements: There are medications and supplements that can help keep your arthritic cat comfortable. Talk with your veterinarian to determine whether this would be beneficial for your cat or, if he already takes such medications, if a dose change during the winter may be helpful. Do not change your cat's medication dose or give any over-the-counter medications or supplements without asking your veterinarian first. Small doses of many human medications can kill cats. Cats can get frostbite and it usually occurs on the toes, ears, and tail. If it is cold enough outside to be concerned about frostbite for yourself, be concerned about your cat as well. Limit or eliminate your cat's time outdoors during frigid temperatures. If your pet has been outside during extremely cold temperatures, examine his skin for any areas that look pale. If you find any, contact your veterinarian immediately for help. Cats that are outdoors by themselves may have a harder time finding their way back home during the winter. The normal smells and sights of the neighborhood are disguised by snow and frozen ground. If you absolutely must let your cat outdoors, make sure he has a proper collar, ID tags, and consider having him microchipped. We are reminded often throughout the warm months not to leave our animals alone inside of a parked car. It may not be as obvious that this is a dangerous practice in cold weather also. Being left inside of a cold car for long periods is like being left outdoors. Your cat will be trapped in very cold conditions, risking frostbite and hypothermia. It is best if your cat does not stay outdoors during the winter. It can be extremely dangerous at worst and uncomfortable at best. If you are completely unable to bring your cat inside, consider a heated garage, shed, basement, laundry room, or any heated shelter. If it is absolutely necessary to keep your cat outdoors, pay close attention to the following requirements. An outdoor cat MUST have a shelter option during the winter. This shelter must be well-insulated and should be big enough for him to stand up, turn around, and curl up. The shelter must also have a wind-block to keep frigid air from blowing in on him. You MUST keep fresh water available for your outdoor cat at all times. You must check the water bowl often to ensure that it hasn't frozen, tipped over, filled with snow, or gotten dirty. Fresh, unfrozen water is essential to your cat's health. An outdoor cat will require increased calories during the winter. Give your cat more food so that he can keep his body conditioning up and be better able to stay warm. Cats CAN get hypothermia and freeze to death outdoors during frigid temperatures. This is more common in younger and older cats but, in certain conditions, can happen to any cat. With some attention to your cat's extra needs during cold weather, you can both better enjoy the season and count down to warmer days. Why Should I Take My Cat to the Vet?